A few years ago while perusing other traveler blog posts, I came across one about Ronda, Spain. Up to that point, I hadn’t even heard of this little town in the middle of nowhere. The blogger’s pictures of a town perched on a cliff overlooking a gorgeous gorge was all it took for me to put it on the list! We spent one night in this little town just long enough to be able to meander down to see the gorge from below and take in the beauty of one of the largest ‘White Hill’ towns in Spain; it’s all the time you really need there. A lot of folks actually try to do this as a day trip from Seville or Granada (albeit, a bit rushed). I feel like the more Hubs and I travel, the more we want to take our time in each place and be part of the scenery, instead of only seeing it from behind our cameras. We’ve been privileged to have enough time to “smell the roses”, but it’s definitely not taken for granted. In addition to the gorge, we also learned that Ronda is the birthplace of modern Spanish bullfighting. This town is home to the oldest bullring in Spain. We made it just an hour before it closed, so we practically had the whole place to ourselves to explore. It’s quite amazing to see where the bulls are held and if you looked closely at the inside of the doors, you can see all sorts of horn gouges on the inside of the stall doors. Side story at the Ronda bullring: Hubs was off on his own taking a few photos at the horse stables, but needed to put his phone through the window bars to take some photos. 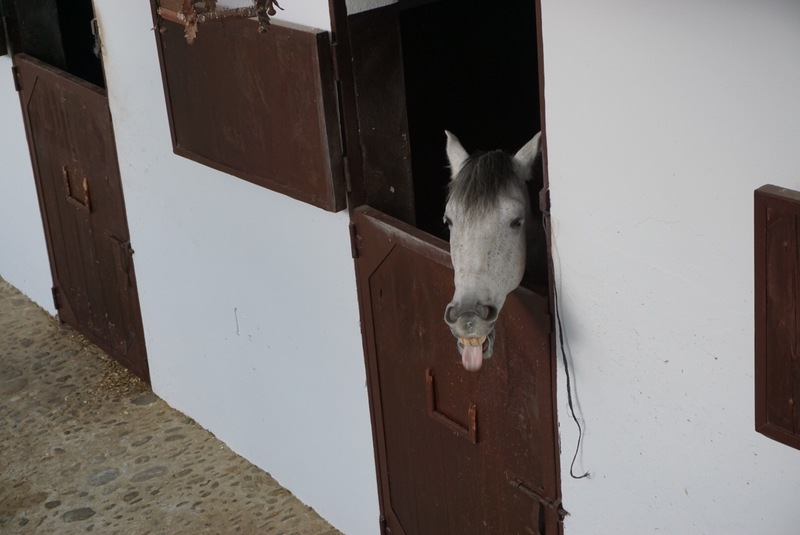 He got a couple, and then ‘oooops!’, he dropped his phone from about 10 feet, down into the horse stable courtyard. The courtyard was inaccessible by visitors and he had to go ask for help with his broken Spanish, and even had to mime riding a horse to tell them where it was :’-) He would have used Google translate, but ‘oooops!’ again, he didn’t have his phone. The staff giggled a bit at his misfortune, but were very nice and helpful to retrieve it. While we were waiting, one of the horses witnessed what was going on and stuck his tongue out at Hubs, almost laughing at him too. In the end, Hubs was lucky the phone was in a case and uninjured from fall.